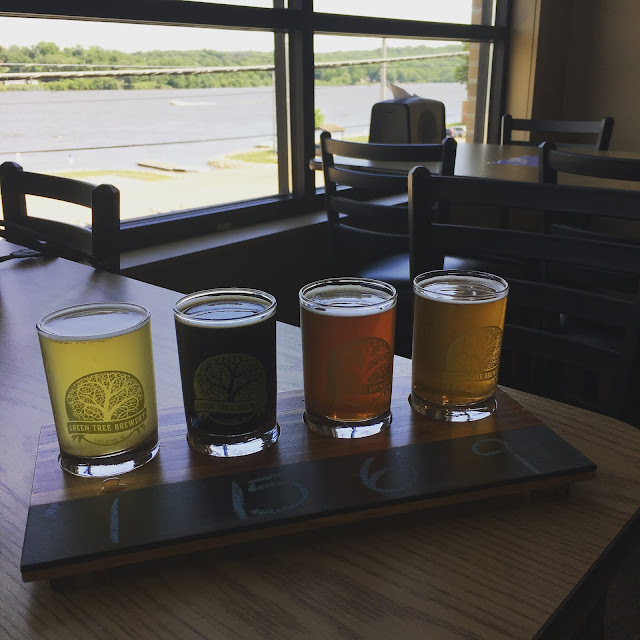 On a visit to Iowa last week, we made our way to a lot of eateries - and a couple breweries, and a tasting room at a winery and at a distillery. This brewery, Green Tree Brewing, happens to be right next to a distillery and overlooks the Mississippi River. That's the mighty Mississippi outside the window in the photo below. There's also outdoor seating and it's a lovely setting for sitting and sipping some brew. With about a dozen beers on tap, it was hard to narrow it down to four for a flight. There was a nice variety, so you could find something you'd like no matter kind of beer you prefer. My favorite was the Mango Me Happy. There were also a number of stouts with unusual flavors - like mint and peanut butter. They don't have food available, but you can bring in food from a nearby eatery. The Blue Iguana has fantastic authentic Mexican food and is just a block or two away.